After the great success of the recent commemoration of the Crash of Beaufighter JL710 sixty three years ago there was discussion about flying from Templeport lake. 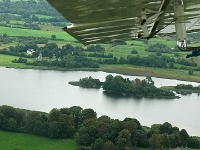 We believe no aeroplane has ever successfully lifted off from the water of Templeport lake so Steve Powell a colleague who had read the booklet about the Crash of the Beaufighter and owns one of the few amphibian aircraft in Ireland based close by at St Angelo airport Enniskillen brought his Maule Super Rocket amphibian float plane "Foxtrot Charlie" down on the lake on Saturday morning 19th August. Although the day was dull with occasional showers and periods of heavier rain we did manage to take a number of photographs both of the aircraft itself and the area around Bawnboy. Steve Powell, one of the principals of The Amphibious Flying Club is a fully qualified flying instructor and commercial pilot. Ian Thompson and Hugo Wilhare had this little anecdote in their report on the 'Flying in Ireland' Forum of their trip around Ireland listing the light aircraft they saw. While we were at the museum, in the far distance, an amphibian aircraft was noted lining up to land on Lough Bofin close to Dromod. To far away to even make out the aircraft type. Phil Bedford told us that was a normal occurrence, with frequent visits from the Killaloe based LA.4’s and N210SA Maule (now up for sale). A quick look later showed nothing. The Maule M-7-235B Super Rocket a high-wing STOL aircraft powered by a 235 hp Lycoming engine was previously registered as N210SA. It has a wingspan of 32' 11" and length of 23' 8"
It was a pity the weather hadn't been better but it was a lovely experience anyway! I hope you enjoy the photographs which were taken by Isabel and me, They are copyright however you are welcome to use them for private or personal purposes. If you'd like larger photographs please mail us. If you want to use them commercially please contact . If you click on the first thumbnail you may run the subsequent photos as a slide show by clicking this icon however you will need a reasonably fast internet connection. The original scanned version of the front cover story by Bob Davy of the Maule on floats in Pilot magazine is available here and a smaller version (1.3 MB) of the same article is here.